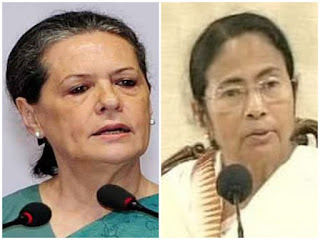 West Bengal Chief Minister Mamata Banerjee will today meet Congress president Sonia Gandhi in New Delhi. While the main purpose of the meeting is speculated to be the selection of a Presidential candidate, the two leaders are also likely to discuss the formation of an anti-Bharatiya Janata Party (BJP) coalition to counter Prime Minister Narendra Modi-led NDA in the 2019 Lok Sabha elections. With President Pranab Mukherjee's term set to end in July, Gandhi has already met Janata Dal-United JD (U) leader Nitish Kumar and Nationalist Congress Party (NCP) leader Sharad Pawar. Congress (TMC) leaders are under the scanner in Saradha and Narada scams. Sources in the TMC said that Banerjee might place President Mukherjee's name as one of her choices. However looking at the present situation, where the party is on the radar due to the ongoing investigations involving several scams, the West Bengal Chief Minister might settle for a common candidate selected by all major parties.